This has been bugging me for quite some time, and in recent light I finally decided to write something about it. If you are a normal user, like me, aren’t you annoyed as well by emails sent from do not reply or no reply at whatever.com? What provoked me to dedicate this post to a matter that appears so simple was that in the last week I received no less than 7 do not reply to emails, most of them having no real reason behind the behavior. Really now, unmentioned online store, you personalize your emails and call me by my first name, take care to include bright, colorful images of your products and people using them happily, but if I want to say anything you just don’t want to hear it, right? You are allowed to bother me, but it doesn’t work the other way around? Please, if you’re a business and are currently using this method of contacting your subscribers, just stop! The best way to describe the feeling one gets when receiving a do not reply to email is that the person/business just doesn’t care! These days, when everything’s about connecting to people, knowing your customers and tailoring to their needs, no reply emails seem more like a blast from the past than a real part of a marketing strategy. No reply emails clash with any customer-oriented image a company tries to create, since there is no actual reason why I can’t reply normally to the message, just like I’m doing for all other emails I receive. Even more, some messages don’t even include the information needed to contact the sender, so most likely I will have to go to their website, browse around, find an online form and add all my relevant data, which takes time I’m sure none of us have to spare! The do not reply to email stems from an outdated mentality that considers emails as a cheaper billboard or pamphlet, but I’m pretty sure that it can and does alienate potential customers… Whereas on the road we have no alternative but to look ahead and peripherally see a particular vendor’s offer, in our Inboxes we are kings! So, when I see a message that has but a minor relevance to what I’m interested in and to which I am specifically told to not even bother replying to, I have to fight the urge to mark it as spam, something that I’m sure many do straight away! Don’t take me wrong, there are cases where it doesn’t matter if a do not reply to email address was used; for example, one of the messages I received last week was from Google, informing me that their Wave app will expire. This is OK because Google has such a large customer base that it doesn’t matter if I take offence – they know that I’m hooked to their services and so, take this precaution so that they don’t receive thousands of emails pertaining to the Wave app or unrelated stuff from their portfolio. They sent me a short notification and that’s it – they didn’t try to sell me anything and they provided all relevant info. This is actually how it should be done! But, when I receive an offer from an online store, or a notification from a company I am personally dealing with (my mobile provider, for example), I believe I have all the right to get offended! In the end, it’s simple: businesses should stop using do not reply to emails – it makes them seem rude and distant! It’s a much better idea to encourage communication, and if you’re currently using this type of message why don’t you just create another address and forward the emails received to the appropriate departments? People will reply even to do not reply to addresses, and if you don’t have the time to manage this type of centralized contact then take a look at Auto Reply Manager for Outlook which can scan and automatically forward each message to the appropriate person. You can choose to scan the subject lines and bodies of all incoming emails, and can also set-up a rule that replies with a “thank you for contacting us, we’ll get back to you as soon as possible” message and many more. 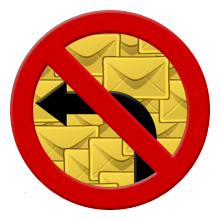 In fact, if you promise to stop sending no reply emails, we’ll even throw in a $10 discount (so, the price for a license would be just $29.95)! As always, we welcome your feedback! Please reply either in the comments section below or at support@emailaddressmanager.com. << What impact does the email’s from line have?